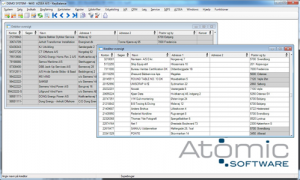 Atomic Software is a Danish company with a history of over 20 years in the ERP applications market. Its activity is concentrated mainly in the Scandinavian area (Denmark, Sweden and Norway). The company approached us with a request to help them with development of their main product – KeyBalance ERP. The current version of the KeyBalance ERP product is a compact Windows application, based on file databases. Its user interface stems from definitions created in Windows 3.11 / 95, and therefore it does not meet today’s requirements. In addition, the whole ERP core is created by many DLL files. If these DLL files are wrongly configured, they cause the application to crash and create system instability. After analyzing existing ERP software, APRO company co-operated directly with Atomic’s developers to create a modern COM interface for accessing data. All communications with the interface are in XML. This COM interface can run on the local computer, or on a server, as a service to which all clients connect. As a next step, APRO designed and created a new KeyBalance ERP front end which communicates exclusively using XML structures processed by the COM interface. The KeyBalance ERP front end provides the user with an up-to-date interface in accordance with today’s standards, and is fully compatible with the application’s old version. If necessary, both client applications can run simultaneously. The KeyBalance ERP front-end application has no fixed user interface. All dialogs and menus are created during the run, with the help of received XML structures. This ensures maximum flexibility, and the ability to easily change the language of the user interface. For example, if there is a need to change the appearance of one of the dialogs in the ERP application, all that is required is to change the XML definitions in the database, and the changes will be immediately displayed in the whole ERP application. APRO company continues to assist Atomic Software with the development of other modules for KeyBalance ERP, through the provision of direct developer support.